I went to pick Wally V up from his Sunday morning class after our church service last Sunday. “Do you want to go home and get ready?” I asked. He looked at me and burst into tears, “My head hurts!” he balled. I escorted him through the crowds and to the car, feeling like a bad mom for not having noticed he might be sick. You see, it was all working out perfectly, according to my plan. Husband Wally and Vivvi had been groggy with colds the day prior, but were on the mend, recovering at home instead of going to church because today was the big day—the day I told all my friends about when they asked what my favorite family holiday tradition was. It was the day that I had shamelessly begged into fruition. It was the day I’d been waiting for since October, since the idea of the holidays started to dawn on me. Today we were all going to be healthy and happy and hear the slay bells-jingling-ring-ting-tingling, dammit. Today we were going to meet Santa. I know, I know. How common. How commercial. How strange, to have this likely dreaded and anxious time full of long lines and beef-and-cheese Santas be my most treasured of all treasured holiday times. I can feel you on the other side of these words shaking your head in confusion, accusing me of sitting on a throne of lies. But let me clear it up for you. A few years ago I was at story time with my kids at a cozy local bookstore, Prairie Path Books. The owner was saying that when her children were young, she stood in long lines with weary parents to slap reluctant, screaming kids on you’ll-shoot-your-eye-out Santa laps, only to be rushed along and asked to pay $20 for a pretty terrible photo to commemorate the worst hour of all of December. 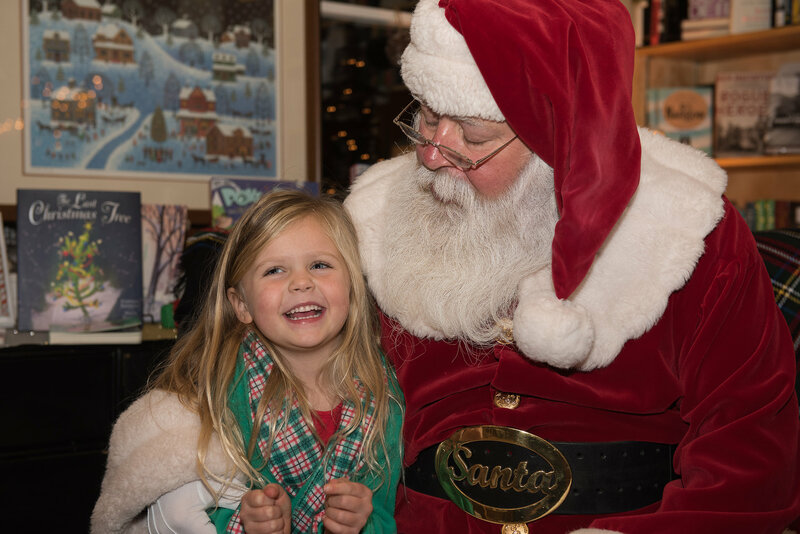 So when she opened her beautiful bookstore, she said, “Not on my watch,” and brought to fruition the experience she always imagined for her kids. I am going to tell you about the experience she created, and you are going to hate me for finding it. I’m sorry in advance. But please, join me next year. I will book my spot, and then I will tell you to book yours. Because I don’t want you to get my spot, because I love you, but I’m sorry, I love this warm memory just a little eensy teensy bit more. The day of the event, you go to the warm and cozy bookstore and are greeted by tables of wine, cheese, and cookies. 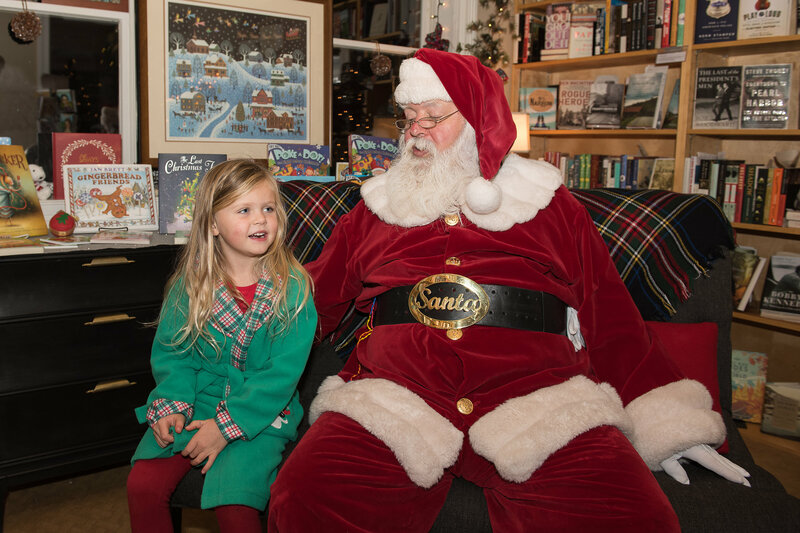 Your kids sit on a rug and listen to Mrs. Claus—the real Mrs. Claus, with real Mrs. Claus hair and a velvet robe and white gloves—read story after story. (She has a bookstore of books to choose from.) Her white gloves don’t allow her to turn pages, so your kids will be asked to turn, and they will feel important for it. Between books she will chat with your kids and give them hugs and take pictures if you want. Then, at your scheduled time, your family is escorted into a special room where Santa sits—the real Santa, with a real beard-as-white-as-snow, and eyes-how-they-twinkle and cheeks like roses. 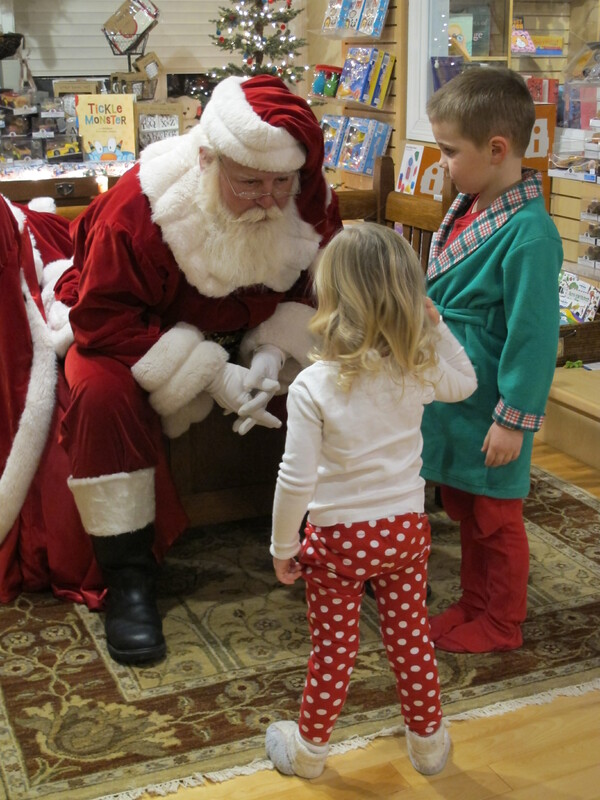 Santa knows your kids names, and when they say which toys they want he knows the toys and asks questions about them. He gives so many Santa hugs and jokes in an unexpected way, and if you have multiple kids, he gives them a ho-ho-ho-filled talking to about being nice to each other. He promises magic on Christmas morning, and both your kids and you walk out believing that it will happen. And now, back to the beginning. We were all on the mend. The day to meet our favorite jolly man in red was upon us. The snow was falling for the first time this season, because of course it was. And Wally’s head hurt. I rushed him home and took his temperature. 100 and climbing. As I watched my holiday dream that I had forced into place crash down before my very eyes, I felt all of the feel bads—the weary world, the sin and error pining, the nasty wasty skunk. But no. The flu is a bad banana with a greasy black peel. And I knew—Wally felt terrible, anyway. So terrible that he said, “I know I can’t go. Can you just have Vivvi bring my list?” That shut my Ebeneezer right up. And as I stood there, breaking heart and awkward social moment witness cringing and full of joy, I realized—it doesn’t have to be all boughs of holly fa-la-la-la-la, la-la-la, la-la. I felt the time continue to march, in the way that it always insists on doing, right through my imagined happiness, my tradition-loving happiness, my beautiful picture that was not to be this year. I felt it march through field and fountain, moor and mountain. I felt it marching on through this bleak midwinter, this weary world, through my appalling dump heap of a soul, and through the dark night toward a star. And I felt it—the thrill of hope. Not pictured here is the one who was at home, wrapped in blankets—the one who didn’t cry, who gave up his spot so quietly, who instructed his sister what to tell Santa, and who so badly wanted her to still go. The one who later watched the video and saw her botching his list so horrendously that he gasped, but then was reassured that he could send a list and was okay. And here is this girl, who is so wonderfully strange, who watched her brother watching the video. 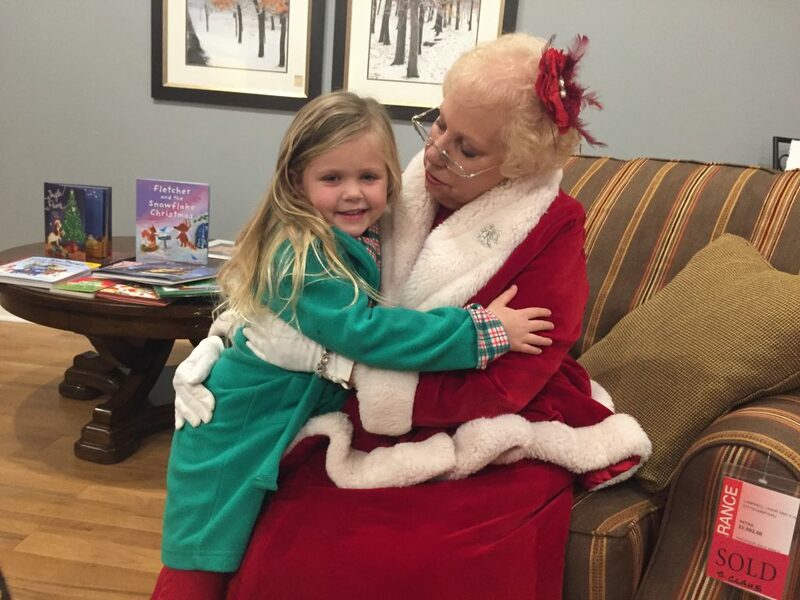 She was so filled up by the warmth of all those Claus hugs that she could not read his horror and was proud of how well she did on her own during the encounter. The whole thing was beautiful ugly, and it was just like life to deliver itself so fully when I wanted so badly for it to be something else. I keep thinking of the Who’s in Whoville. When the Grinch takes all of their things and leaves them only with crumbs that are too small for a mouse—even the Grinch can’t stop Christmas from coming—it came! One way or another, it came just the same. It is all the Christmas story, right? In the darkness, in a stable, a bed of straw—still, a savior baby, the star above—love’s pure light. 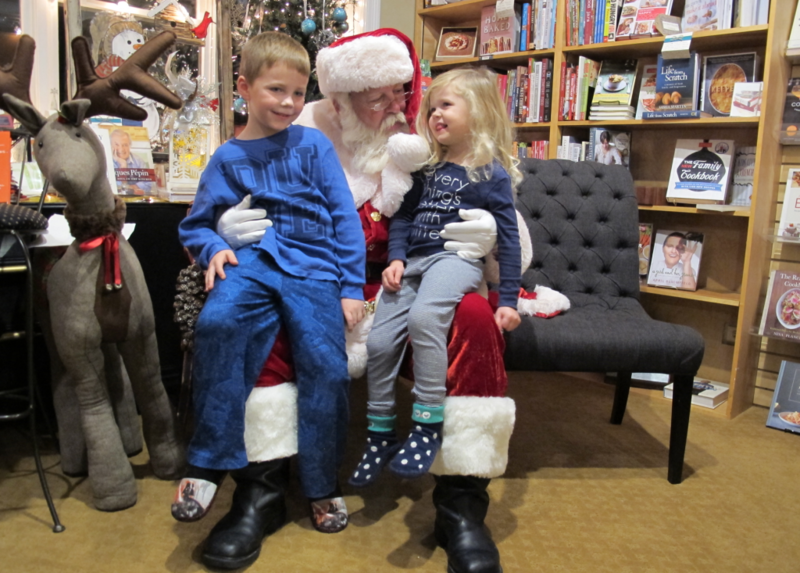 On the way out of Prairie Path books, we said goodbye to Mrs. Claus and passed by Santa’s visiting room again. He and I locked eyes, and I waved. He waved back—and I was full of joy. I think that is one of the best “One way or another” Santa Christmas visits. And, the last photo of Vivi’s smile is priceless!